Greg Tansey believes Inverness Caledonian Thistle were knocked out the Europa League by an Astra Giurgiu side no better than many teams in Scotland. The Romanians progress to face West Ham United in the third qualifying round courtesy of Constantin Budescu's goal in the first leg in Inverness. 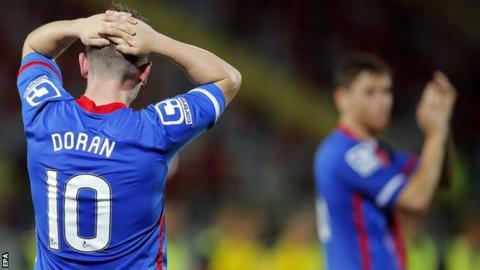 "We look at them and there are better sides in the Scottish Premiership," midfielder Tansey told BBC Scotland. "We more than held our own and I firmly believe we were the far better side." Caley Thistle lost the striking threat of Edward Ofere and Marley Watkins this summer, with replacement Dani Lopez only being signed shortly before the first leg. And Tansey believes the lack of firepower proved costly as the Scottish Cup winners failed to find the net in either outing against Astra. "We gave everything, but we're just lacking maybe that bit of killer edge in the final third and it's something we need to get as quickly as possible," he said. "For the possession we had, I thought we could have done better." Tansey, though, praised the team - and their fans - after the goalless draw in Romania. "They were the home side, they had the weather advantage, but I thought over the two legs we were by far the better side in terms of ball possession," he said. "We looked like the home side and it definitely felt it with the atmosphere from the crowd - they were fantastic tonight - and I'm just disappointed for them that we didn't get that goal." John Hughes was disappointed in defeat despite being "tactically spot on"
Inverness boss John Hughes thought his side had proved themselves worthy of European football. "I think their coach will have been surprised by our style of football," he said. "I felt tactically we were spot on. "It was just that final third, that final pass, the final shot that has to be more clinical. "To lose the tie over a free-kick, I'm bitterly disappointed. "We just needed that goal. There were long periods of the game where you would think we were the home team. We were the better team. "It was only in the last 20 minutes, when we were really expansive, that Astra started getting in on the counter attack." Hughes praised summer signings Nat Wedderburn, the midfielder who arrived from Cowdenbeath, and former Tranmere Rovers goalkeeper Owain Fon Williams. "Really delighted with the goalkeeper," he said. "It looks like we've found one. "Nat was very disciplined in his performance. We need to keep working Dani Lopez - get him fit. That will do him no harm whatsoever. "You can see he's technically a very good footballer. It just takes times for guys to bed in a little bit."